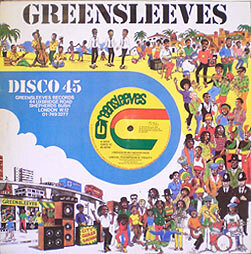 Greensleeves went from being a humble record shop to the leading UK reggae label in the space of just a few years. 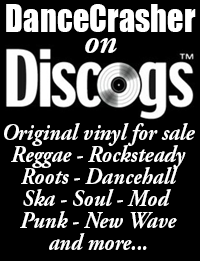 The first issues were 7″s by The Reggae Regulars and Dr Alimantado released towards the end of 1977. By the start of the 1980’s the label was at the forefront of the Dancehall boom in the UK, issuing 12″ Disco 45’s by top producer Junjo Lawes as well as Linval Thompson and to a lesser extent Prince Jammy and Jah Thomas. At the same time a series of groundbreaking dub LP’s mixed by Scientist, using Junjo Lawes and Linval Thompson’s rhythms, were appearing. These boasted some of the most striking, albeit strange, sleeves in the entire history of Reggae music courtesy of Tony McDermott. Below are scans of adverts placed in the music press, mainly Black Echoes, from the late 70’s and early 80’s to advertise Greensleeves product. The distinctive style of these ads made them as memorable and iconic as the classic 12″ sleeve design (also designed by Tony McDermott) used in this era. 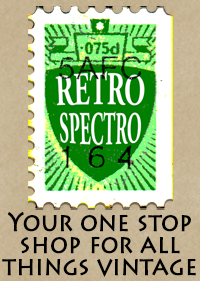 For a history of the label check the Greensleeves site. A complete discography of Greensleeves releases can be found at Tapir’s website. Chris Cracknell production. (GRED 6) 1978. Alimantado Production (GRED 10) 1979. Mickie Scott & Linval Thompson production. Backing by The Revolutionaries. (GRED 12) 1979. Produced by Chris Cracknell (GRED 16) 1979. Johnny Clarke production. Backing by the Revolutionaries. (GRED 30) 1979. JB & Junior Delgado production. (GRED 39) 1980. Junjo Lawes production. Mixed by Barnabus at Channel 1. Backing Roots Radics. (GRED 44A) 1980. Reggae Regulars production. (GRED 48) 1979. Produced by Jah Thomas. Backed by The Roots Radics. (GRED 144) 1984. I am the woman who came up with the name Greensleeves ..I used to be Chris Cracknells partner back on the 70s I I remember Chris saw an ad from Chris Sedgwick ..looking for someone to run a record shop…..the first shop was opened in Ealing. 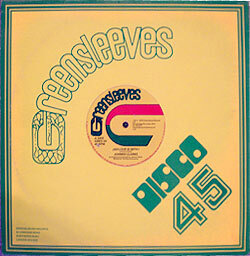 I remember suggesting the name Greensleeves records …and it stuck ever since. I wonder where they both are now. ?….I gather they sold the company. What made you think of the name?